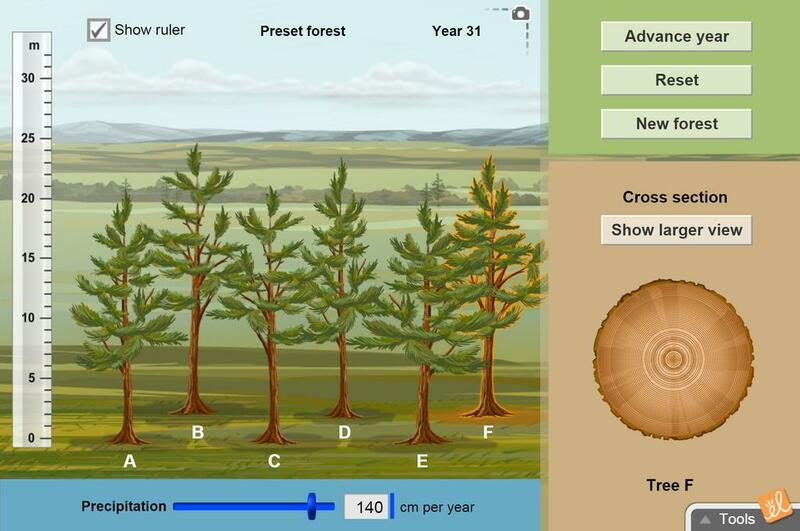 Measure the height, diameter, and circumference of trees in a forest. Count growth rings to determine the age of each tree. Grow the trees for several years and investigate how growth is affected by precipitation. Measure the height, diameter, and circumference of a tree. Determine a tree's age by counting growth rings. Determine how precipitation affects the growth of a tree. Students will measure cross sections of real trees to determine their age. This is a mini assessment to discover if the students have picked up various math and science skills from... (more) the Gizmo guide. It requries critical thinking skills for long answer responses. amazing experiment for data collection. allows sufficient data collection and data manipulation. I would recommend this Gizmo to a teacher teaching measurement. This Gizmo allow students to grow trees for over several years. Now you have your own time machine... for measuring trees! Great little activity to show how amount of rainfall affects the growth of a tree. Interesting to see the cross section of the trunk! This Gizmo as a great cross-curricular activity that links measurement with growth conditions and with finding tree circumference!